Some mainline services to and from Liverpool Street railway station in London have resumed. The terminal is open for the Stansted Express and One Railway's West Anglia routes after delayed engineering works caused its extended closure. 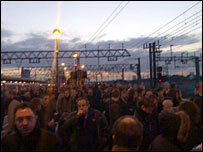 Suburban trains are likely to continue terminating at Stratford in east London until Thursday morning. Network Rail is investigating the extended closure which it has blamed on a shortage of specialist engineers. One Railway, which runs services to the station from the East, earlier advised passengers not to travel into London if their journey was "not important". Services to Norwich, Cambridge and Stansted from Liverpool Street resumed during the afternoon, but face delays. A reduced service is available for some other routes. The closure has affected hundreds of thousands of people, many of whom were returning to work after the Christmas and New Year break. One Railway said on its website: "Until very late last night we were informed that the work was running on time and that we would be able to run a full service this morning. "As a result we were unable to provide advanced warning of the disruption." The Office of Rail Regulation (ORR) said it had started an urgent investigation into the engineering overruns. The ORR added that it would review the planning and management of the works. Anthony Smith, chief executive of customer watchdog body Passenger Focus, said: "Passengers are paying more but the rail industry must keep its side of the bargain by keeping its promises on engineering work. "Telling people not to travel on a working day is an extraordinary message." Meanwhile a fire at a waste processing depot in south-east London has delayed trains on all routes from New Cross station by up to 45 minutes. Firefighters put out the blaze at the Landmann Way depot, which contained oxygen and acetylene cylinders, on Wednesday morning.